Gustavus Ferdinand von Tempsky, adventurer, soldier and artist, learned the benefits of Bowie knife fighting in California while working in the gold fields. He possessed a fine knife of American manufacture for his own use, but had about 30 Bowie knives made to his personal design by a cutler of Shortland St, Auckland. These were issued to the men of No. 2 Company, New Zealand Forest Rangers, under Major von Tempsky's command. Von Tempsky, an experienced fighter, taught his men to use the Bowie knife in one-on-one armed combat. The knife was used to fend off an opponent's attacking blows while a revolver was used in the other hand. The big knives were also used to clear tracks through bush, dig defensive positions, cut firewood and for general use about camp. A 1900 interview with John Toovey, an ex Forest Ranger corporal, appeared in a 1935 issue of The New Zealand Railways Magazine: He had a farm near Te Awamutu. 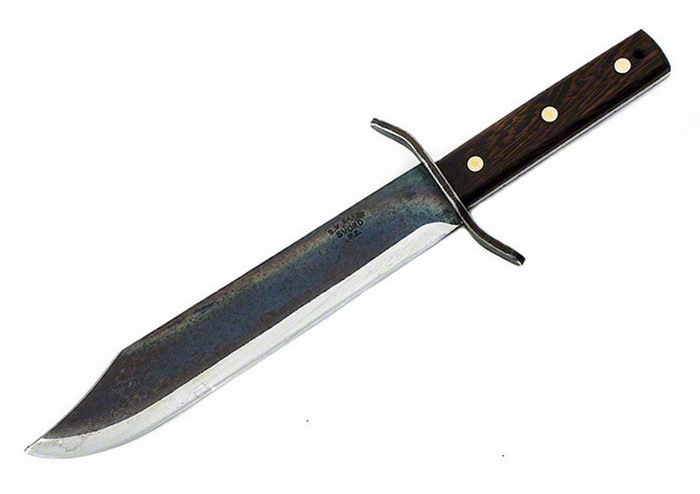 Customarily, out on the farm and in the bush, he wore a sheath-knife on his belt. The knife was a veteran like himself. It had been nine or ten inches long of blade, but the point had been broken off, and he re-ground and pointed it; even then it was like a young bayonet. He told its story, "That's one of old Von's Bowie knives," he said. "He had a lot made for us at a blacksmith's in Auckland when the Forest Rangers were divided into two companies and he had command of me.